I could pre-edit the essays, underlining errors, and then have the “peer edit” session be one where two kids would sit down together and try to figure out what was wrong with the things I had underlined. Any experienced teacher sees the flaw in method #2: I was grading everything twice! It took WAY too long. Then, just two weeks ago I discovered a third way. Big thanks are due to Daniela DeSousa for the idea that, though peers are useless in lower level Spanish for real edits, they are well capable of simple ones. 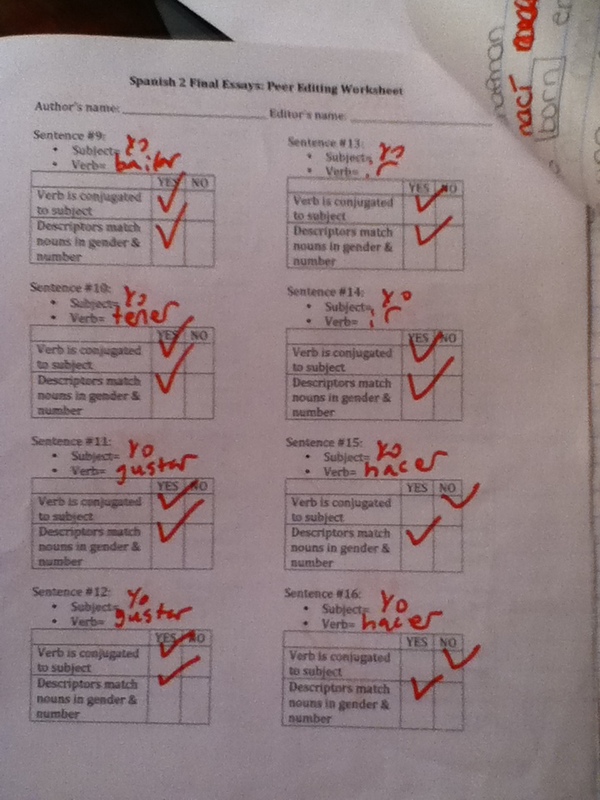 This led me to develop a quick-check peer editing worksheet. In it, students look at their peer’s essay one sentence at a time and search for two (and only two things). Does the verb match the person? And do the descriptions match the nouns? All they had to do was check off little boxes and voilá! I received second-draft essays that were mostly free of errors in subject-verb agreement and gender/number agreement. The kids received all the benefit of a peer edit process and I only had to grade them all once the most glaring errors had already been fixed. Truly a winning worksheet. This entry was posted in Language Learning, Teaching. Bookmark the permalink. Great idea! I just made a similar one for my (middle school) Spanish students. I find that it helps simplify the activity for them. They’re willing to do it, but often don’t know where to start. Thank you so much for this! I have been wondering for a long time how to create a peer review rubric and this is exactly what I need!